Consolidation hasn't paid off as planned for big beer companies. When consolidation began in the beer industry a decade ago, it was supposed to be a big win for shareholders of big beer companies. 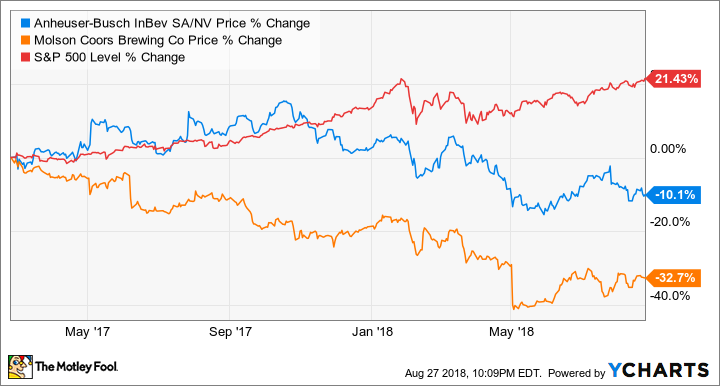 Anheuser-Busch InBev (NYSE:BUD) and Molson Coors (NYSE:TAP) now dominate overall volume in the beer industry both domestically and globally, and in theory they should be able to use their scale and distribution power to grow sales and expand margins. But the reality in the big beer business has been very different from the theory. Market share for big beer brands is declining and pricing power is not what it once was. And big beer stocks are underperforming the market by a wide margin right now. Overall, beer volume is falling slightly in the U.S., exemplified by a 1% drop in volume in 2017 to 196.3 million barrels, according to the Brewers Association. However, craft beer volume rose 5%, so big beer brands are losing share at a rapid rate, and conditions aren't improving in 2018. According to IRI Group scan data, brewers with over 1 million barrels in capacity had a 2.5% drop in volume in the first half of 2018 and those with 100,000 to 1 million barrels of capacity dropped 1.5%. On the other hand, brewers with 10,000 to 100,000 barrels in capacity had a 5.4% increase in volume and those with 10,000 barrels or less in capacity jumped 30.8%. These are the small brewpubs and microbreweries popping up all over the country. According to the Brewers Association, the number of brewpubs, microbreweries, and regional brewers jumped from 2,898 in 2013 to 5,424 in 2016. It's like small brewers are inflicting the equivalent of a thousand cuts on the big beer industry and there's very little that companies like AB InBev and Molson Coors can do about it. The growth of craft beers isn't lost on big brewers. AB InBev has bought 10 craft brewers and is now hoping to grow those businesses organically, offsetting some of the lost volume in traditional brands. Molson Coors recently acquired the Trou du Diable brewery in Canada and the Clearly Kombucha brand in the U.S., expanding beyond beer. Kombucha is fermented sweetened tea. Both companies are willing to invest in acquiring smaller competitors to make up for their own lost business. But chasing acquisitions is rarely a great way to generate value when your core business is in structural decline. And you can see above that acquiring craft brewers hasn't helped their stock price. It's hard to see big beer companies making a strong recovery from where they are today given the trends in craft breweries. Consumers want a local product and are willing to pay a premium for it, making the price advantage big beer has all but obsolete. This isn't to say that big beer will cease to make money, but the business is challenging, and given the uncertainty, these aren't stocks I would jump into today.